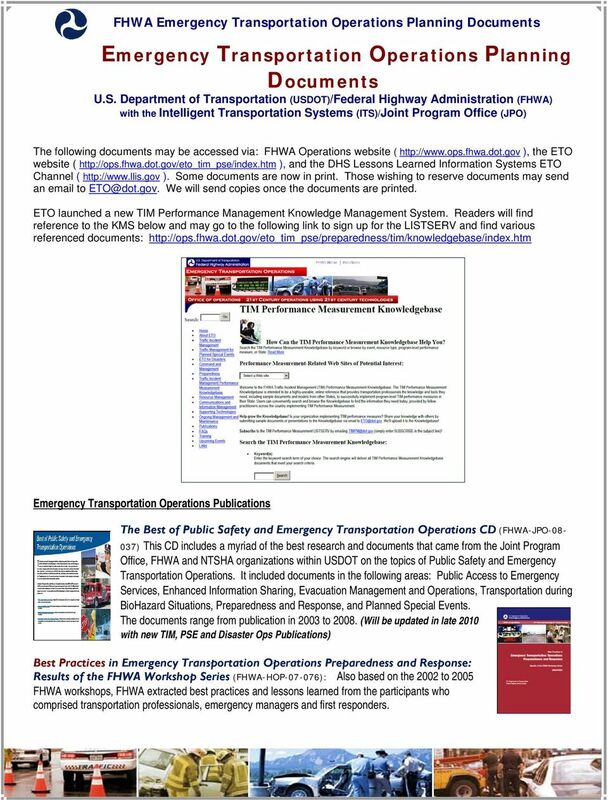 Download "FHWA Emergency Transportation Operations Planning Documents"
1 Emergency Transportation Operations Planning Documents U.S. Department of Transportation (USDOT)/Federal Highway Administration (FHWA) with the Intelligent Transportation Systems (ITS)/Joint Program Office (JPO) The following documents may be accessed via: FHWA Operations website ( ), the ETO website ( ), and the DHS Lessons Learned Information Systems ETO Channel ( ). Some documents are now in print. Those wishing to reserve documents may send an to We will send copies once the documents are printed. ETO launched a new TIM Performance Management Knowledge Management System. 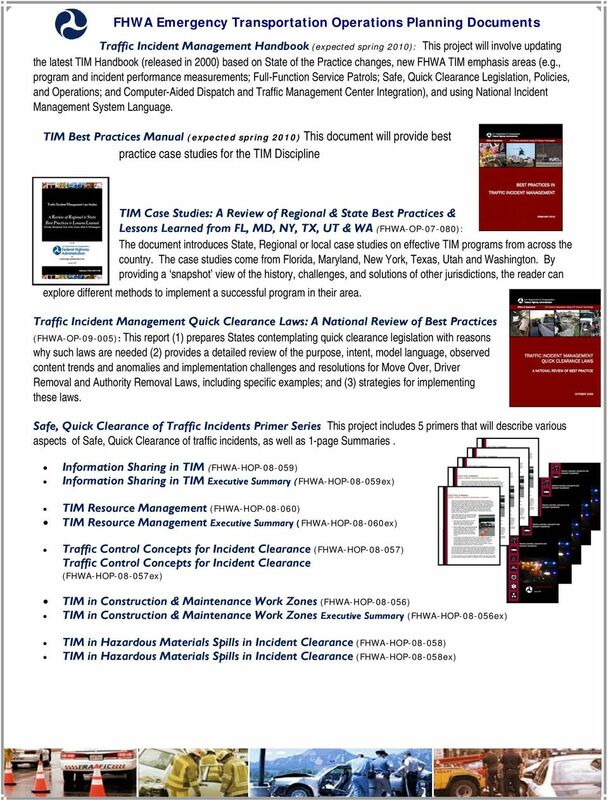 Readers will find reference to the KMS below and may go to the following link to sign up for the LISTSERV and find various referenced documents: Emergency Transportation Operations Publications The Best of Public Safety and Emergency Transportation Operations CD (FHWA-JPO ) This CD includes a myriad of the best research and documents that came from the Joint Program Office, FHWA and NTSHA organizations within USDOT on the topics of Public Safety and Emergency Transportation Operations. It included documents in the following areas: Public Access to Emergency Services, Enhanced Information Sharing, Evacuation Management and Operations, Transportation during BioHazard Situations, Preparedness and Response, and Planned Special Events. 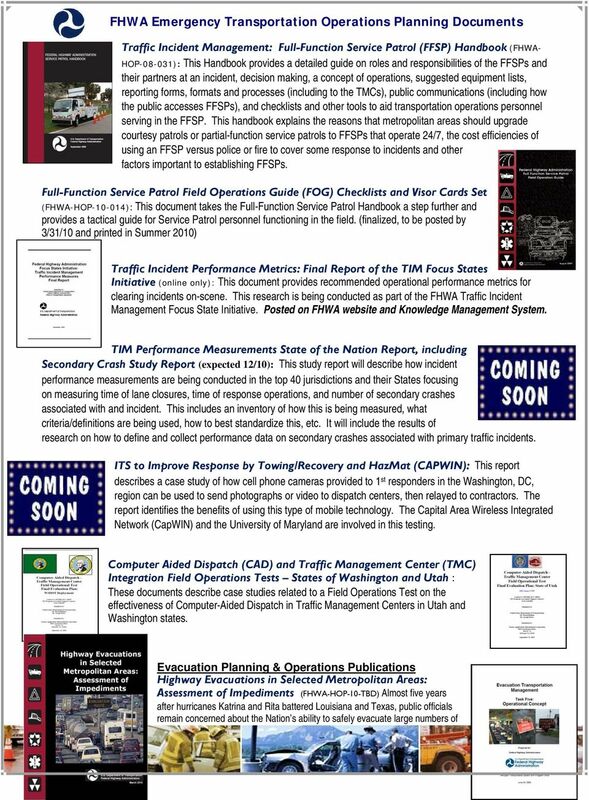 The documents range from publication in 2003 to (Will be updated in late 2010 with new TIM, PSE and Disaster Ops Publications) Best Practices in Emergency Transportation Operations Preparedness and Response: Results of the FHWA Workshop Series (FHWA-HOP ): Also based on the 2002 to 2005 FHWA workshops, FHWA extracted best practices and lessons learned from the participants who comprised transportation professionals, emergency managers and first responders. 6 agencies can use in planning for evacuations; and provides input to the development of tools for real-time management of evacuations, especially from a transportation perspective. Routes to Effective Evacuations Primer Series: Using Highways during Evacuation Operations for Events with Advance Notice (FHWA-HOP ): This first primer in a series that addresses transportation planning for evacuating populations catalogs transportation management and operations advancements that may be applied to improve evacuation planning and operations when advance notice is possible. 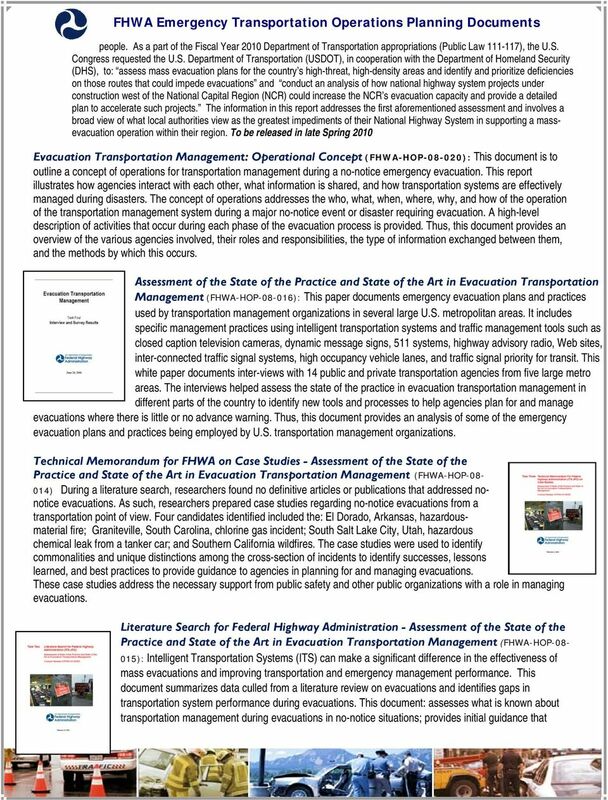 This primer is a tool to aid local and State planners maximize the highway network and transportation tools and capabilities in evacuation plans and operations for their communities, States or regions. 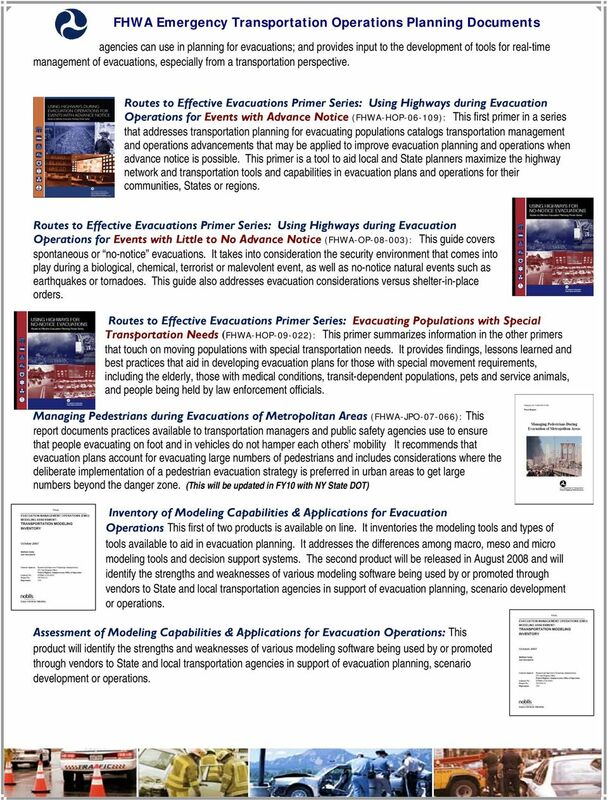 Routes to Effective Evacuations Primer Series: Using Highways during Evacuation Operations for Events with Little to No Advance Notice (FHWA-OP ): This guide covers spontaneous or no-notice evacuations. It takes into consideration the security environment that comes into play during a biological, chemical, terrorist or malevolent event, as well as no-notice natural events such as earthquakes or tornadoes. This guide also addresses evacuation considerations versus shelter-in-place orders. Routes to Effective Evacuations Primer Series: Evacuating Populations with Special Transportation Needs (FHWA-HOP ): This primer summarizes information in the other primers that touch on moving populations with special transportation needs. It provides findings, lessons learned and best practices that aid in developing evacuation plans for those with special movement requirements, including the elderly, those with medical conditions, transit-dependent populations, pets and service animals, and people being held by law enforcement officials. Managing Pedestrians during Evacuations of Metropolitan Areas (FHWA-JPO ): This report documents practices available to transportation managers and public safety agencies use to ensure that people evacuating on foot and in vehicles do not hamper each others mobility It recommends that evacuation plans account for evacuating large numbers of pedestrians and includes considerations where the deliberate implementation of a pedestrian evacuation strategy is preferred in urban areas to get large numbers beyond the danger zone. (This will be updated in FY10 with NY State DOT) Inventory of Modeling Capabilities & Applications for Evacuation Operations This first of two products is available on line. It inventories the modeling tools and types of tools available to aid in evacuation planning. It addresses the differences among macro, meso and micro modeling tools and decision support systems. The second product will be released in August 2008 and will identify the strengths and weaknesses of various modeling software being used by or promoted through vendors to State and local transportation agencies in support of evacuation planning, scenario development or operations. Assessment of Modeling Capabilities & Applications for Evacuation Operations: This product will identify the strengths and weaknesses of various modeling software being used by or promoted through vendors to State and local transportation agencies in support of evacuation planning, scenario development or operations. 7 Low-Cost Surveillance of Rural Evacuation Routes: This will be a project report that explores commercial products that could provide sensing and surveillance, independent of wire-line communications and power availability from the electric grid and at substantially lower costs than traditional ITS infrastructures. Traffic Planning for Special Events Publications Managing Travel for Planned Special Events (PSEs) Handbook (FHWA-OP ): This handbook presents and recommends policies, regulations, planning and operations processes, impact mitigation strategies, equipment and personnel resources, and technology applications used in the advance planning, management, and monitoring of travel for planned special events. Managing Travel for Planned Special Events (PSEs) Executive Summary (FHWA-HOP ): This document is for decision makers and senior officials who must be familiar with Planned Special Events (PSEs) and must provide safe travel to and from these events; the value of regional collaboration; and the merits of local, county and/or state agencies from transportation, transit, public safety, and private sector partners working together in planning and implementing these events. Drawn in part from the handbook, this summary also covers cost recovery and focuses on the Decision Maker s Responsibility to Community and the Stakeholder Challenges and Goals. 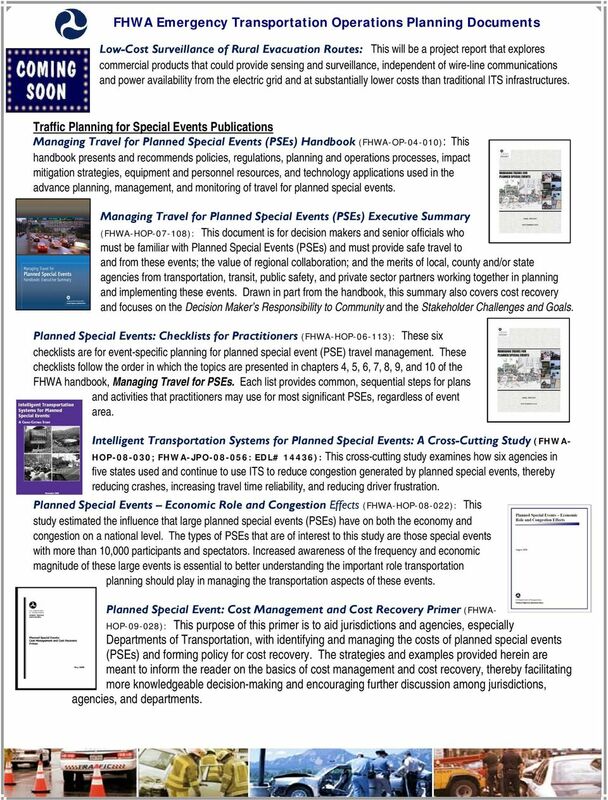 Planned Special Events: Checklists for Practitioners (FHWA-HOP ): These six checklists are for event-specific planning for planned special event (PSE) travel management. 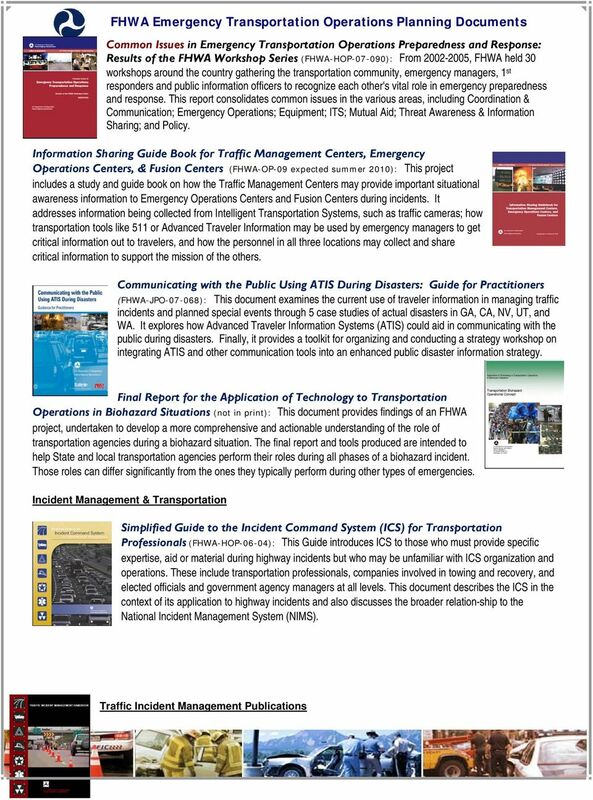 These checklists follow the order in which the topics are presented in chapters 4, 5, 6, 7, 8, 9, and 10 of the FHWA handbook, Managing Travel for PSEs. Each list provides common, sequential steps for plans and activities that practitioners may use for most significant PSEs, regardless of event area. Intelligent Transportation Systems for Planned Special Events: A Cross-Cutting Study (FHWA- HOP ; FHWA-JPO : EDL# 14436): This cross-cutting study examines how six agencies in five states used and continue to use ITS to reduce congestion generated by planned special events, thereby reducing crashes, increasing travel time reliability, and reducing driver frustration. Planned Special Events Economic Role and Congestion Effects (FHWA-HOP ): This study estimated the influence that large planned special events (PSEs) have on both the economy and congestion on a national level. The types of PSEs that are of interest to this study are those special events with more than 10,000 participants and spectators. Increased awareness of the frequency and economic magnitude of these large events is essential to better understanding the important role transportation planning should play in managing the transportation aspects of these events. Planned Special Event: Cost Management and Cost Recovery Primer (FHWA- HOP ): This purpose of this primer is to aid jurisdictions and agencies, especially Departments of Transportation, with identifying and managing the costs of planned special events (PSEs) and forming policy for cost recovery. The strategies and examples provided herein are meant to inform the reader on the basics of cost management and cost recovery, thereby facilitating more knowledgeable decision-making and encouraging further discussion among jurisdictions, agencies, and departments. Salem Community College Course Syllabus. Section I. Course Title: Principles of Emergency Management. Course Code: EME101. NIMS Study Guide. Lesson One: What Is the National Incident Management System (NIMS)? What is NIMS?